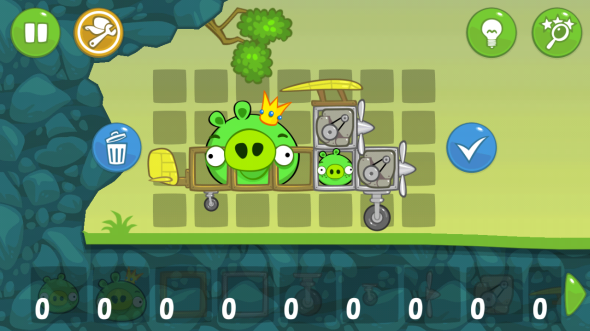 Bad Piggies game has got a great update with new levels, tools and features. For those who have forgotten the details of this puzzler, we would like to remind that Bad Piggies is a Rovio game, in which you are fighting on the side of pigs. The full game's review is here. Also with Bad Piggies update you will be able to use three new tools: glue, magnet and turbo charge that will be very useful during the creating of your crazy vehicles. Another interesting tool is a hook that will make the driving much easier. And you will be able to test this arsenal in 30 brand-new levels that will also be available in Bad Piggies update. By the way, the new Bad Piggies update is completely free, so you can try it just now!